There are so many timeless wedding themes. 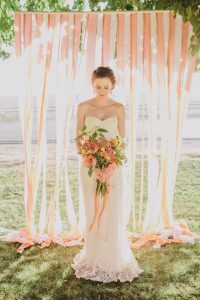 Pretty vintage weddings with family heirlooms and a sense of romance, and gorgeous rustic weddings filled with wood, lanterns and nature-inspired decor will always be popular. 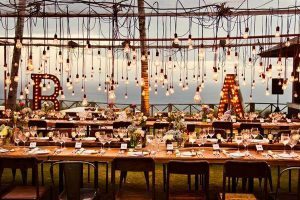 However, 2018 is set to offer couples the opportunity to bring something a little different and edgy into their theme, setting their day apart from the rest. 2017 has been all about paper flowers, doughnut walls, gin tins and chalkboard signs. 2018 brides, Pinterest boards at the ready – here’s what’s predicted to be hot in 2018…. 2018 is forecast to see a new trend in transparent settings and venue décor. Venues that are mainly made of glass, like Orangeries, or light, airy spaces with floor to ceiling windows, are tipped to be a very popular choice, and will complement tables styled with different items made from glass or semi-transparent materials. 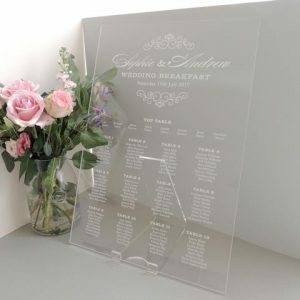 How about a hanging Perspex seating plan? This is definitely one for couples who love a minimalist look! 2018 will bring the opportunity to be more adventurous when it comes to those elements that would traditionally have been printed onto paper. Fabric, wood and stone are predicted to feature highly and will add a twist to things like traditional paper place names. 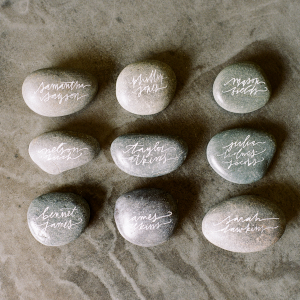 Hand painted pebbles, pieces of slate or marble tiles make great place name holders and can easily double up as wedding favours. So grab the chalk pens or paints and get crafty! A wreath is not just for Christmas! Wreaths are destined to become a popular alternative decoration for 2018 weddings, whatever the season. 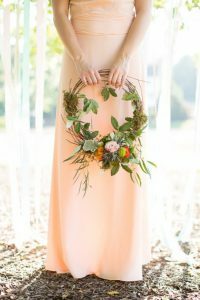 Lots of foliage mixed with wild flowers and grasses will create modern flower arrangements that are guaranteed to impress and are just perfect for a rustic, boho or woodland wedding. 2018 bridal collections are setting a monochrome trend, with designers such as Vera Wang using ribbons and belts in black on pure white dresses. It may seem at odds with a classic white theme, but incorporating touches of black into wedding décor is set to bring a modern twist to venue decor, and is guaranteed to add drama to any wedding! 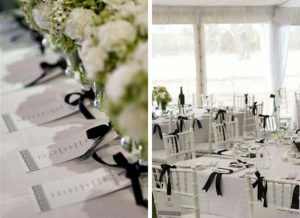 One of the simplest ways to do this is to add black ribbons to chairs, flowers and table settings. 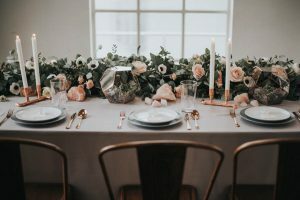 Fairy lights and industrial chic were both big wedding trends in 2017, and in 2018, it will be all about combining them into one! Edison bulbs produce a flattering warm light and look fantastic hanging from beams or in clusters for a modern twist on a chandelier! Move over paper flowers – the 2018 trend is for a colourful, eye-catching ribbon backdrop for either a top table or a photo booth. DIY brides will love this one, as it’s so easy to create using ribbon, lace, fabric or crepe paper, and this is one decoration idea that is sure to look amazing in photos! These sparkling natural beauties are reckoned to be huge for 2018 weddings. 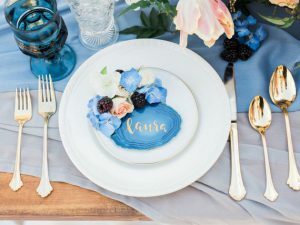 Geode wedding cakes have been taking the internet by storm, so why not embrace the trend and incorporate geodes and crystals into wedding decor? How about place names made from slices of agate in gorgeous shades of blue, turquoise, pink or purple. Or crystals hanging from a white wishing tree, catching the light as they spin. Or why not combine two trends and have glass terrariums alongside large pieces of pink quartz, the stone of love and romance, as centrepieces? South Coast Weddings offers wedding planning packages across Dorset and Hampshire, from On the Day Coordination through to a full wedding plan. Contact us!